Robert E. Lazarski, 83 of 320 Missouri Lane, Den-Mar Gardens passed away on Sunday, March 17, 2019 at his home. Born in Kulpmont on January 4, 1936, he was the son of the late Peter and Isabelle (Walavage) Lazarski. He was a 1953 graduate of the former Kulpmont High School. 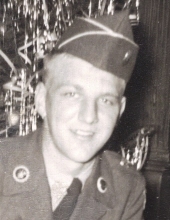 He volunteered for service with U.S. Army in 1954 and was honorably discharged in 1956. He attended Franklin and Marshall College. On July 16, 1960 in the former St. Ignatius Church in Centralia he married his beautiful and loving wife Mary C. (Mehilosco) Lazarski who preceded him in death on July 13, 2013. Earlier in life he worked at Shamokin Hospital as a medical laboratory technician. Later he was employed at Merck in Danville in the chemical and electronics divisions where he helped process crystals for use in early semiconductor devices. He also worked for Sealtest Foods, Kraft Foods and Packaging Resources in Mt. Carmel Township, where he became plant manager for 13 years preceding his retirement in 2000. He was a member of Our Lady of Mt. Carmel Parish. He was a former member of the Centralia town council. During his tenure as a council member he was involved in negotiations with the state and federal government for the purpose of relocation. He is survived by one son Robert F. Lazarski of Den-Mar Gardens. There will be no viewing or visitation at the request of the deceased. Graveside services will be held at All Saints Cemetery, Ralpho Township at the convenience of the family per the deceased request. Joseph J. Stutz Inc. Funeral Home 40 South Market Street, Mt. Carmel, Joseph J. Stutz, III Supervisor is in charge of arrangements. To leave a condolence please sign the guestbook at www.stutzfuneralhome.com. To send flowers or a remembrance gift to the family of Robert E. Lazarski, please visit our Tribute Store. "Email Address" would like to share the life celebration of Robert E. Lazarski. Click on the "link" to go to share a favorite memory or leave a condolence message for the family.